Material comes by Great Lakes freighter, railroad cars and trucks to the Kuhlman Bulk Materials Facility strategically located in Toledo, OH in the heartland of America’s agricultural heartland and industrial Midwest. The Kuhlman site at 444 Kuhlman Drive in Toledo features a mammoth warehouse with nearly three acres of bulk-materials storage under roof and more than 14 acres of outdoor storage. It’s ideal for the storage and distribution of bulk materials such as fertilizers, aggregates, animal feeds and road salt. Docking facilities are available for the largest self-unloading freighters, and Kuhlman’s yard can accommodate 25 railcars. Trucks come and go quickly, and Kuhlman’s facility, only 11 miles from the Michigan border, is an ideal transfer point for double-trailer Michigan trucks, carrying up to 50 tons of material. The Kuhlman Bulk Materials Facility is located at Interstate 75/Exit 200, which provides regional north-south expressway access. Five miles south, I-75 intersects with the Ohio Turnpike, providing east-west regional expressway access via I-80/90. The Norfolk Southern Railroad provides connections to other national rail carriers nearby. Toledo is one of the top-five rail-freight areas in the United States. Strategically located on the Great Lakes. Storage accessible by ship, by rail, by truck. Located on Michigan truck route for Michigan double-trailer loads. Flexibility to accommodate diverse needs. Unmatched professionalism and attention to quality and service. Ample, quickly accessible open and covered storage. 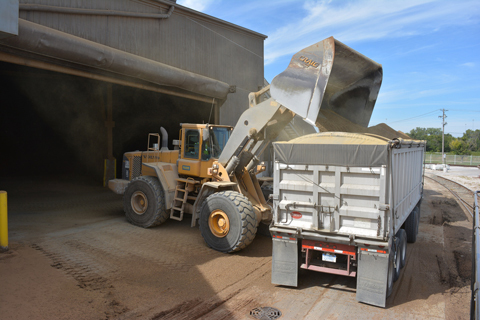 Commodities are delivered to the Kuhlman Bulk Materials Facility by self-unloading freighter, railcar or truck, and then depart by railcar or truck. Ample indoor and outdoor storage is available. The Toledo area provides numerous backhaul opportunities. Kuhlman provides fast-in and fast-out loading of trucks with computer-controlled inbound and outbound certified scales. Also speeding the process are large-capacity loaders with onboard scales and high-reach capability. Outbound railcars can be loaded at the rate of 300 tons per hour. Kuhlman operates its own locomotive for moving railcars. 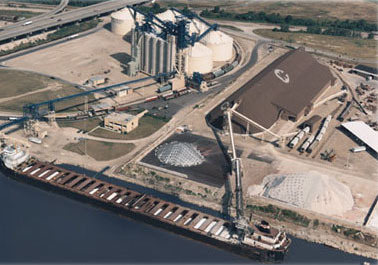 If you ship bulk materials on the Great Lakes or throughout America’s agricultural and industrial Midwest, put Kuhlman and its Bulk Materials Facility to work for you today. Call Steve Smigelski at 419/897-6000 or 800/669-3309 for more information. Or email him at ssmigelski@kuhlman-corp.com. For reliable service and cost-effective storage, specify the Kuhlman Bulk Materials Facility.